The messages come as fighting intensified on the outskirts of the main rebel-held city Benghazi and French President Nicholas Sarkozy confirms that French jets are now enforcing a no fly zone around Benghazi. U.S. President Barack Obama, speaking in Brazil, said the people of Libya must be protected and he said the coalition enforcing the no fly zone in Libya is prepared to act to do that. Forces loyal to Libyan leader Moammar Gadhafi shelled targets inside the main rebel-held city of Benghazi Saturday as battles intensified in several outer suburbs. Both al Arabiya TV and al Jazeera TV, quoting eyewitnesses, said tanks loyal to Mr. Gadhafi had entered Benghazi. In Paris, western diplomats held a summit at Paris’ Elysee Palace to discuss military action in Libya. 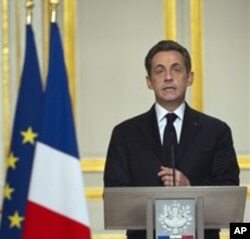 French President Nicholas Sarkozy spoke after the meeting, indicating that French, Arab and other western states had begun to enforce a no-fly zone near the rebel controlled city of Benghazi, but that Colonel Gadhafi could still comply with U.N. Security Council demands. He says [the West] is intervening in Libya according to the U.N. Security Council mandate with Arab League approval in order to protect the Libyan people from the murderous folly of a regime that has lost all legitimacy by assassinating its own people. The Libyan people he adds must be able to chose their own destiny. He stresses that there is still time for Mr. Gadhafi to respect the demands of the international community, at which point diplomatic activity will resume. He says that Mr. Gadhafi wrote that the Libyan people support him and he is ready to die for his people. He claims that Libya is fighting al- Qaida’s North African branch (AQAM) and no one else. He asks Mr. Obama what he would do, if al-Qaida captured and took control of an American city? He goes on to say that the U.N. Security Council resolution is illegal and unjust, because it infringes on the U.N. charter, which forbids meddling in a country’s internal affairs. He adds that Libya is not targeting civilians and asks outside observers to come and confirm this. In Benghazi, former interior minister Abdel Fattah Younes, now a top rebel leader told al Jazeera TV that Gadhafi tanks were "beaten back by rebel fighters using rocket-propelled grenades." Early Saturday a warplane belonging to rebel forces was shot down over Benghazi, crashing in a ball of smoke and flames. Rebel leader Younes confirmed that pro-Gadhafi gunners downed the plane but that the pilot ejected safely. Arab satellite TV channels showed images of civilian homes damaged by shelling inside the city. Numerous casualties were reported. Rounds of automatic rifle fire crackled into the air throughout the day, punctuated by the intermittent sounds of explosions. Amid the fighting, hundreds of civilian vehicles were seen fleeing Benghazi towards Tobruk and the Egyptian border. Witnesses at the Egyptian border post of Salloum saw scores of Libyans, including women and children, who had entered Egypt. Witnesses reported that pro-Gadhafi forces also attacked the rebel-held western Libyan towns of Zentan, Nalout and Misrata. Tanks and field artillery reportedly pounded all three cities.